THE Irish Air Corps was called in early this Friday morning to assist 30 fire fighters from Limerick and neighbouring counties to tackle an extensive gorse fire. 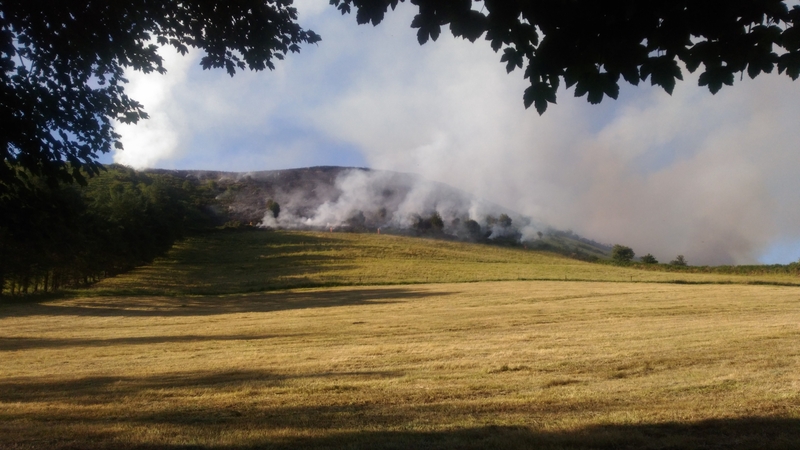 Fire crews from Limerick, Cork and Tipperary battled a large gorse fire which broke out early on Thursday morning. The alarm was raised shortly after 5.30am after the blaze was spotted at the townland of Lackendarragh, near Anglesboro. “We had to get the air corps from Baldonnel to assist us. They came in with the helicopter and dropped water,” said one fire officer. “We were in a queue for the helicopter. They were in Meath and Wicklow. There were a lot of fires across the country. We have it under control now. We are just keeping an eye on the situation,” the fire officer continued. Three units from Kilmallock Fire Station were deployed along with crews from Tipperary Town and Mitchelstown and a water tanker from Rathkeale and Cappamore. “We were fighting it until 1am and we finished up at around 2am,” the fire officer added. Local residents have praised the firemen for their continuing efforts on what has been the hottest day in Ireland in more than 40 years. There had been concerns in relation to mature forestry were the gorse fire to spread further. The cause of the fire is not known and there are no reports of any injuries. Crews from Limerick Fire and Rescue Service have extinguished a number of smaller gorse fires throughout the day.